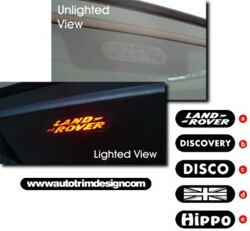 Personalize your Land Rover Discovery with this uniquely designed Third Brake Light Decal that shines your choice of one of the designs as shown above whenever you apply the brake. Decal fits on all Discoverys that have a Third Brake Light that look like the one in the illustration. Decal is provided in Premium Black 5-7 year exterior grade vinyl, completely and exactly cut to the shape of the light's outline. Easy to install!